Integrate SIP with existing systems and simplify your communications architecture! SIP is transforming instant messaging, voice, and video communications, by adding intelligence and reducing cost. The new world standard for facilitating communications, SIP makes it easier to communicate with the right people, at the right time, on the right device. This book shows you how SIP can be easily integrated into any large or small enterprise to lower cost, improve productivity, and simplify communications. This site is not affiliated with John Wiley & Sons, Inc., the publisher of SIP Communications For Dummies® by Peter Gregory, CISA, CISSP. 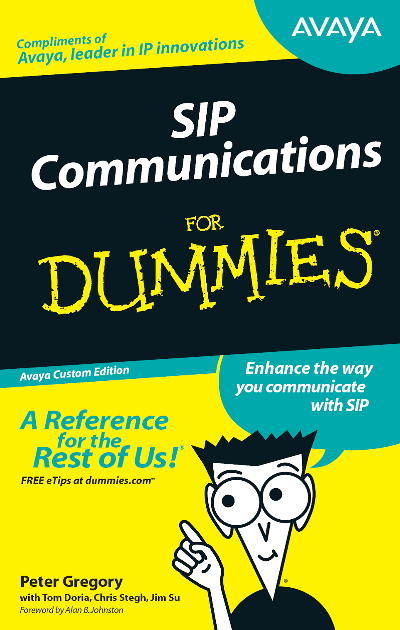 SIP Communications For Dummies is Copyright © 2006 Wiley Publishing, Inc. All rights reserved. Reproduced here by permission of Wiley Publishing, Inc. For Dummies, the Dummies Man logo, A Reference for the Rest of Us!, and related trade dress are trademarks or registered trademarks of Wiley Publishing, Inc. in the United States and other countries. I would like to request a hard copy of the book SIP Communications for Dummies. My advice is to contact your local Avaya sales representative and ask for a copy.